I’m a firm believer in enjoying yourself at this time of year. If you want a certain food or drink, have it. Don’t go overboard, but satisfy your urge, and don't feel guilty about it. You know what “they” always say: “everything in moderation, including moderation.” That’s me. And I think December is a good month to give yourself a little break. Except for your birthday, there's no better time to indulge. Having said that, if you genuinely like something that happens to be healthy (or at least less unhealthy), then that’s always a welcome thing. Enter the pomegranate gin fizz. It's got pomegranate in it, which is a superfood. It’s supposed to be loaded with antioxidants (which help fight cancer) and anti-inflammatories (which help fight pretty much everything else). But don’t kid yourself… this drink has simple syrup in it. So it’s not healthy. But the pomegranate makes it better for you than it would be otherwise. This drink screams "holiday" with its bright-but-translucent red hue and green rosemary sprig. And holiday cocktails can have a reputation for being too sugary. But with a gin base and some bright lemon, this drink is just as refreshing as it is sweet. Make the rosemary simple syrup in advance. Boil a cup of water and a cup of sugar until the sugar dissolves. Once it does, remove the syrup from the heat, add the rosemary sprig and let it sit for 15-20 minutes. Remove the rosemary and refrigerate the syrup until you make your cocktail. When you’re ready to drink, mix the syrup with the gin, lemon juice, and pomegranate juice. Shake with ice, and then pour into an ice-filled rocks glass. 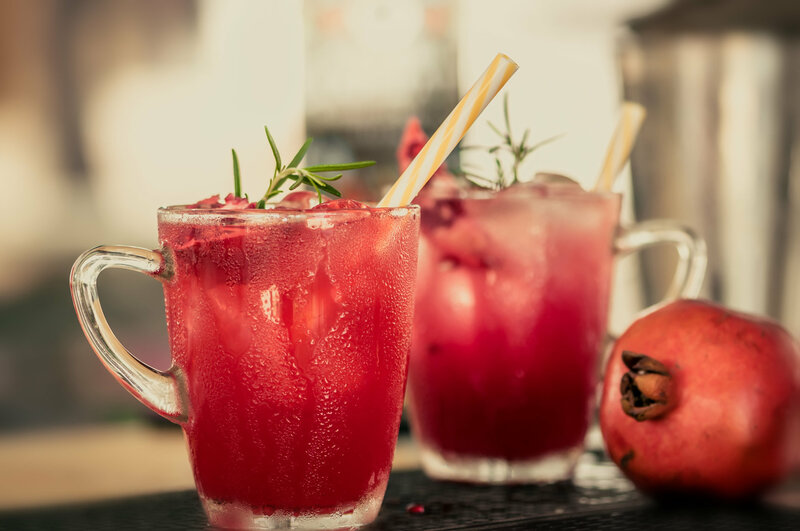 Mix in a splash of club soda for fizz and garnish with a new rosemary sprig and pomegranate arils. Enjoy! I hope you have a wonderful holiday season. PS - Did you know I take requests? Let me know if you’d like a certain kind of ingredient or drink and I’ll find something for you. Tweet your requests to @cocktailspy, post them on Facebook at CocktailSpy.com, or email them to thecocktailspy[at]gmail.com.